I must again reiterate how much I can disclose about where I am going in Rwanda since privacy is a factor for those who live there. However, I can at least use the name and share some information about it (especially because I need to fundraise a bit). I am told by my Kenyan friend that East Africa is the best Africa, and I am excited to experience it for myself. Landing in Kigali, the project (Project Tikkun) will stay in the capital for a few days, visiting different parts of the city, specifically monuments and museums that document the genocide that took place there from April to July 1994. We will have guides, despite the fact that we have two Rwandan gentlemen already in the project; although, they may need a break and not want to lead a horde of Westerners around their cities and towns. After Kigali and perhaps a safari, we are headed to the youth village: Agahozo-Shalom. Inspired by a kibbutz in Israel that took in orphans after the Holocaust called Yemin Orde (which we are visiting as well), Agahozo-Shalom is a progressive community established to promote growth through education and goodwill after the Rwandan Genocide for Rwandans all over the country. It is a home for its students, creating families after so much was lost. I literally have so few images that could correlate with this post. 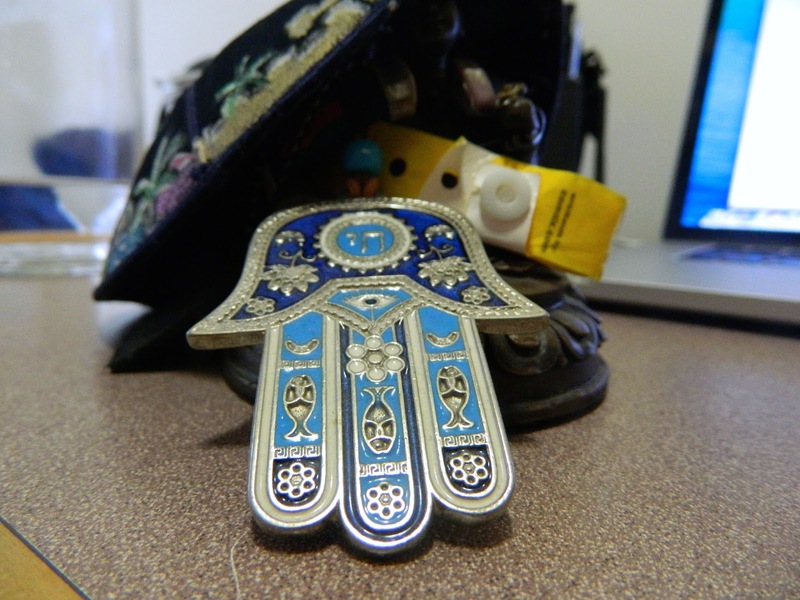 Please humour me and my hamsa that sister bought for me when she went to the country. Also, my Bubbe wants me to get her a mezuzah while in Israel, so I have more to do too. Oy vey. We will do service with the community for the rest of our time in Rwanda (approximately 4 days), learn how it functions, and then fly to Israel. In Israel (which is exciting for me, as it is my first time), we will land at 3 am and rest before a day of sightseeing around Jerusalem. Coincidently, we will be arriving on Yom Ha’atzmaut (Israeli Independence Day), so it may be a smidgen wild at the beginning. I am excited for an Israeli folk dance session we are going to catch. I want to see how it jives with my belly dance. After this excursion and time in the Holy city, we will be heading up to Haifa and then visiting the youth village kibbutz off which Agahozo-Shalom is based. Later, we will return back down south to Tel Aviv and work with a group helping Arab-Israeli relations through language! Hooray! Arabic FTW! I am glad we are going to discuss and address the Israeli-Palestinian occupation while we are there. It has been a topic largely overlooked by the group thus far. Assuming I will stay registered, I will bring the textbook in my duffel and try to get the syllabus beforehand at least. Nevertheless, I will not let myself get bogged down in a book while abroad. But hey, maybe some Rwandans and Israelis will want to learn about phonemes with me. Either way, get excited for May! That is right. We are headed across the Pacific that soon. I want to again ask for those who have read this far to donate to my Agahozo-Shalom Youth Village page. Big, small, in the middle, all donations are appreciated. I have met with individuals who have both helped establish this village and been members of its community. I have heard about the stories that come from this place and what it means to those who go there. The money will not go to some faceless administration. Go to the website here. See the people who it will benefit. We are trying to raise $6,000 USD. I thank you for your time and generosity. I am already excited and I have not even left yet! Yippee! Get ready for a spectacular May and even more incredible summer. I may be stopping down below the border, no, not that border, the other border, Mexico, to see a friend. We shall see. The plot always thickens. However for now, I will do my best to keep updating you all about this lovely city I making my new home. P.S. This happened a little while ago, but I met the Attorney General of Canada/ Minister of Justice/ so many other amazing titles recently! Phenomenal woman.